Catalan painter Clara GrÃ cia draws inspiration from nature's atmospheric sensibilities. Having been formally trained in Paris, GrÃ cia's aesthetic looks to the Impressionistic and Fauvist idioms that emerged in the nineteenth-century French school. 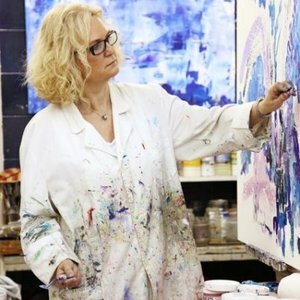 The artist employs traditional materials, including oils and acrylic paints as well as canvas supports. Her compositions vary in size from small and intimate to large and dramatically commanding. However, her botanical subjects alleviate any sense of intimidation the spectator may feel upon viewing her large-scale paintings, in turn enabling one to meditate on the bright and saturated blues, greens, and pinks that often dominate her landscape paintings. In using a palette knife rather than traditional brushes, GrÃ cia captures scenes from nature with hurried and equally broad strokes of paint. However, the artist does not sacrifice nature's intrinsic complexities. Rather, GrÃ cia's thick impasto intensifies these complexities with its palpable texture. Her forms seem to blend and interact with one another, harking back to the existing symbiosis within nature.